nudo — nicole jane debler. Contrast; a word of many opposites. Contrasts can be found in all aspects of human culture. It’s what differentiates things and people from each other. Contrast creates different perspectives and even tension. Contrast is the underlying theme throughout this thesis. Specifically contrasts in the Mexican culture, where people see two perspectives, the native and the contemporary. Mexico is a country where there is extreme contrast—from its landscapes, traditions and how people live. Growing up in Mexico City was an opportunity to experience a rapid moving city. There existed a wide gap between the modern and indigenous community. The native groups of Mexico still exist and practice their traditions and crafts to maintain their rich culture. Unfortunately, the native culture is lost in the modernity of the city and is disrespected by the modern. It’s important that this cultural gap is brought to light in order to celebrate both sides. Nudo is the middle point of these two extremes. Nudo means knot in Spanish and is where both these worlds exist as equals. Nudo presents three books that investigate the contrast that exists in Mexico. In both form and concept, the books represent three core values and traditions found in the Mexican culture: textile, personas and storytelling. The books explore rich visual worlds; the modern and native without preference over the other. From materials, textures, popular culture, craft and photography, Nudo makes you pause and reevaluate our assumptions of contemporary and traditional Mexican cultures. This project was a multifaceted design experimentation. From photography, travel, typography design, book design and texture experimentation, Mexico's contrasts were scrutinized. Nicole documented her thesis in two places. The first one was her hometown Mexico City, where she analyzed and photographed the contemporary culture in it's architecture, materials, lifestyle and how people interact with each other and the environment. 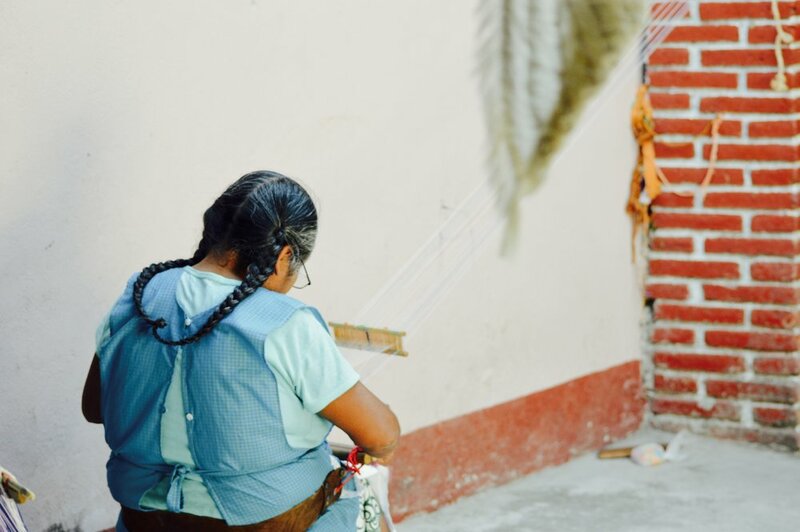 Then, she visited Oaxaca City, a state that thrives in traditional practices and culture such as it's famous textile practices called "telares". Here, she focused on documenting the process of making these telares and the symbolism of them for native people in Oaxaca. She also noticed a clear contrast in architecture and lifestyle in where Oaxaca was a magical town that seemed that no time had passed since the Mexican revolution. Seeing these contrasts made Nicole realize the rich beauty of her country and how both points of view need to be respected. But, can find a place to coexist in order to live in one same place, and this was when Nudo was born. The typographical treatment designed for Nudo, encompassed the modern and traditional aesthetics found in the different textures, symbolisms and landscapes in Mexico. A modern base typography was used as a base Existencial Light, and then symbolic geometric ornaments where designed to fit the type that alluded to both contrasts of the culture. The three shapes used were circles, triangles and lines. The type was used in order to give character and a texturized aesthetic to the branding and design on Nudo. The photographs for the books were printed in different materials. For one of the books each photograph was printed in a different texturized paper that alludes to the material or texture that the real life object or texture has. For instance, the Soumaya building in Mexico City is made of steel and it's texture was printed in a metalic, shiny paper to allude to it's real life essence. The books for Nudo were manually bound in order to allude to the artisanal processes in the Mexican culture. This process was done very carefully because many of the papers were very delicate and with complex fibers. The manual binding gave the books a sense of individual art pieces that are very unique and hence omen the symbolism of Mexican culture and textiles.